Although we've had a scorching summer so far, we're having a pretty rainy weekend presently, but I still fancied a cider to cool myself down a bit. You see with the rain I seem to be slowly getting over a rotten cold, which is making me run hot and then shivery. I've managed to avoid colds for some time, so I suppose I was due one. However, it feels almost foolish to have stinking cold during a heatwave! 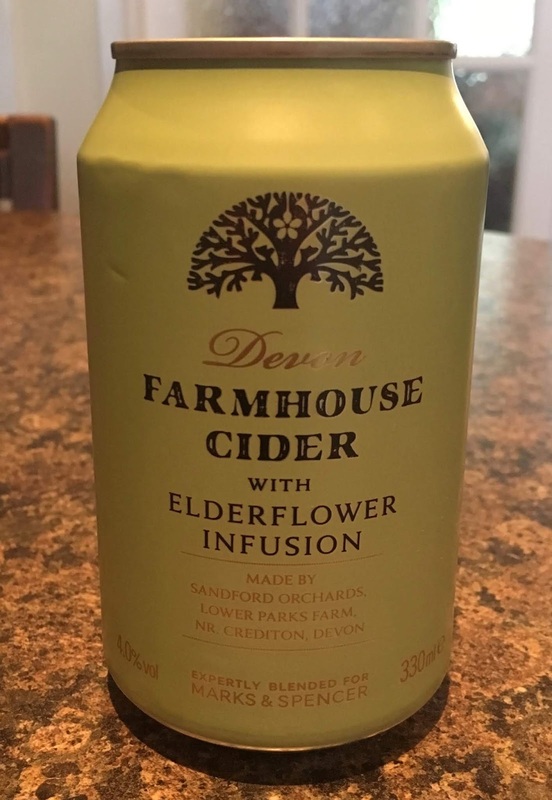 This Devon Farmhouse Cider was produced by the Sandford Orchards especially for Marks & Spencer. Sandford Orchards's Lower Parks Farm has been tending and growing fruit trees for generations. At 4% volume this cider has had elderflower added in the brewing. On opening there was quite a strong smell of elderflower to the cider apple aroma from the can. Lightly sparkling this golden cider bubbled excitedly into my waiting glass. On taste this sweet cider was predominantly cider apple with a light and refreshing citrus twist and a touch of elderflower into the aftertaste. I see what they mean on the label where this Devon Farmhouse Cider could be good for washing down Asian spicy fishy dishes, but I enjoyed it just as well with a good old tuna and cucumber sandwich!